Hey Bigg Will , Guys ...can you provide the part number this? Want to make sure I get the correct pump. I have 50 k so in the spring I want to do water pump as well .THANKS . It's on the pump in the first picture I posted in the thread. But here is exactly where I got mine. Last edited by Bigg Will; 01-25-2016 at 12:49 AM. Thanks BW...yeah saw it after I posted my question ...but thanks for confirming ! Cheers. 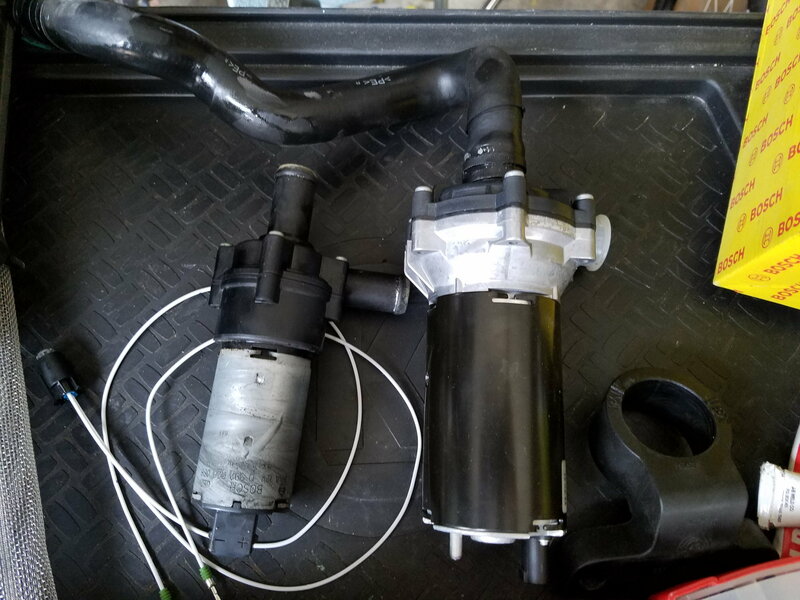 I purchased the pump from amazon, and the mbz connector and wires online from a dealership. I should be doing this install next weekend if all the parts show up on time. So I just got around to doing this after getting a code and reduced performance error for cooling performance. I pulled mine out and have all the parts, but my pump looks WAAAAY smaller than the new one. Is it possible my 2009 xf SC is very different from your XFR? Should I replace it anyway? Honestly, I got in there and only after I got everything taken apart did I see that my main, mechanical pump has some dried coolant that makes me think it's leaking, which is probably what is causing the error. The pump I'm replacing is probably completely fine, so if I need to just put it back together as is, that's probably ok.
Last edited by n8ertot; 10-30-2016 at 06:03 PM. Reason: Adding info about failed pump. It's definitely different (smaller) than my factory pump was, and no I wouldn't put the old one back in. Blackcoog has done this upgrade to his 2009 4.2L SC. Last edited by Bigg Will; 10-31-2016 at 06:09 AM. It's definitely different (smaller) than my factory pump was, and no I wouldn't put the old one back in. Blackcog has done this upgrade to his 2009 SC. Thx. I was a bit worried about clearances and such. Just got done putting it together and it seems like it works so far (crosses fingers). Unfortunately, now I have to replace the mechanical pump, since that appears to be the actual problem. Just be careful that you changed the correct pump, there are two electric water pumps, one for the intercooler, one for the heater. Good point, and one I was unaware of since the (my) 5L cars only use the one electric pump. I'm pretty sure this is the right one, but now I'm scared. This one is to the left of the radiator, hanging from behind the housing. Please tell me that's the correct one. Both pumps are in the same location, if you're looking from the top of the engine bay down, the heater pump is above the chargecooler pump. On the X350 XJR and the STR, you have better access to the chargecooler pump from underneath. The chargecooler pump is mounted at the bottom of the radiator. I'm 99% sure you've got hold of the heater pump, not the chargecooler pump. K. This was definitely way easier to access from above, so must be ok. If it was easier to access from above then I think you got the heater pump, the chargecooler pump is easier to access from below. You literally have to get access to the bottom of the radiator to change the chargecooler pump. Craaaaap. Are the pumps the same or different units? I sorta "stole" the connector off the bottom of the old pump to make the adapter between the old wiring and new pump. Well Crap. Guess I'll be tearing back into it when I get back in town. Thanks for letting me know. Does this mean I need to take the radiator out or is it pretty self explanatory once I get the skidplate off from underneath? Honestly i've never had to get to the pump on an XF so I can't say for sure, but on the X350 XJR there was no need to take the radiator out.